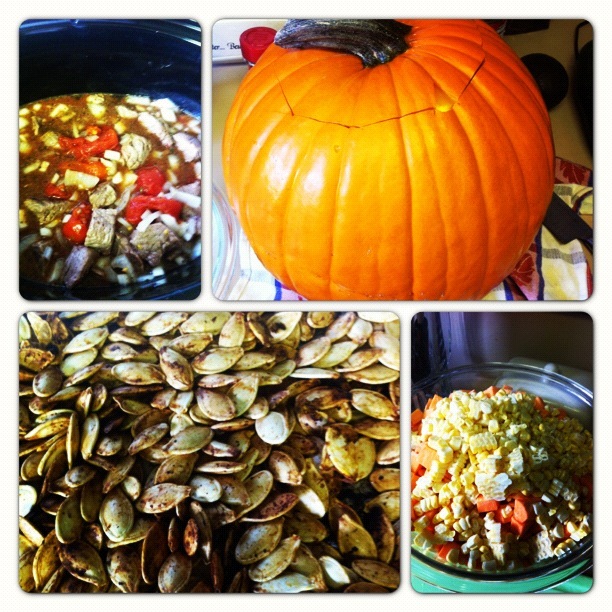 For my first blog post- I wanted to start out with one of my favorite fall recipes. 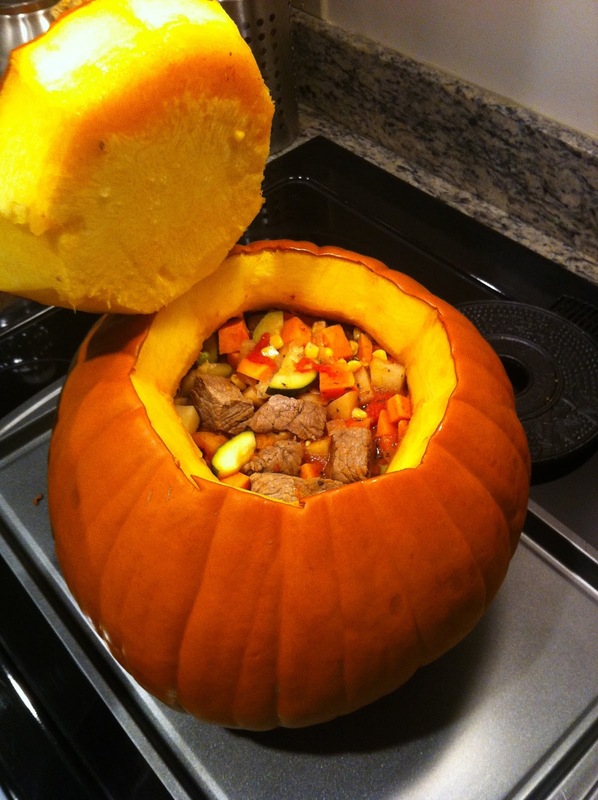 I always loved when my mom made this stew because you serve it IN the pumpkin. I loved watching her scoop hearty spoonfuls of yummy stew right from the pumpkin on the table (Martha Stewart is kicking herself she didn’t invent this multifaceted meal… table decor and entree in one!) 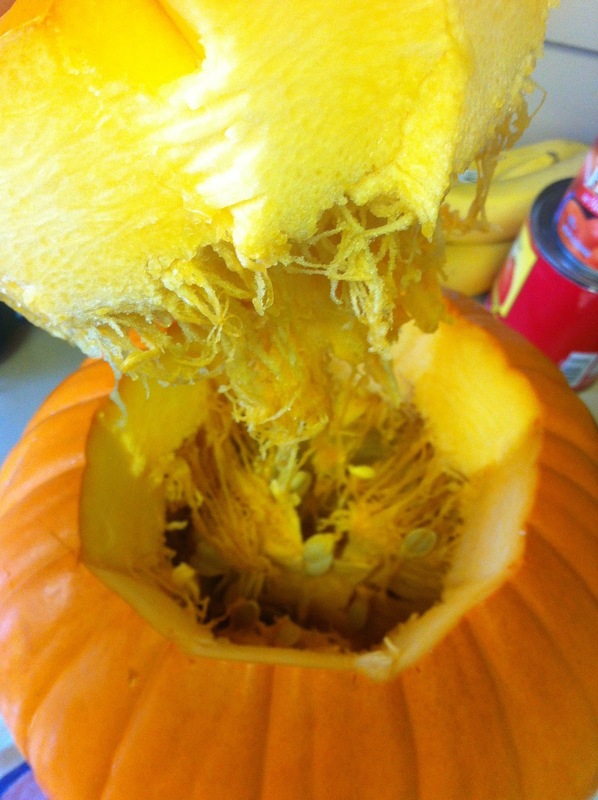 … plus you get chunks of pumpkin when you serve it! 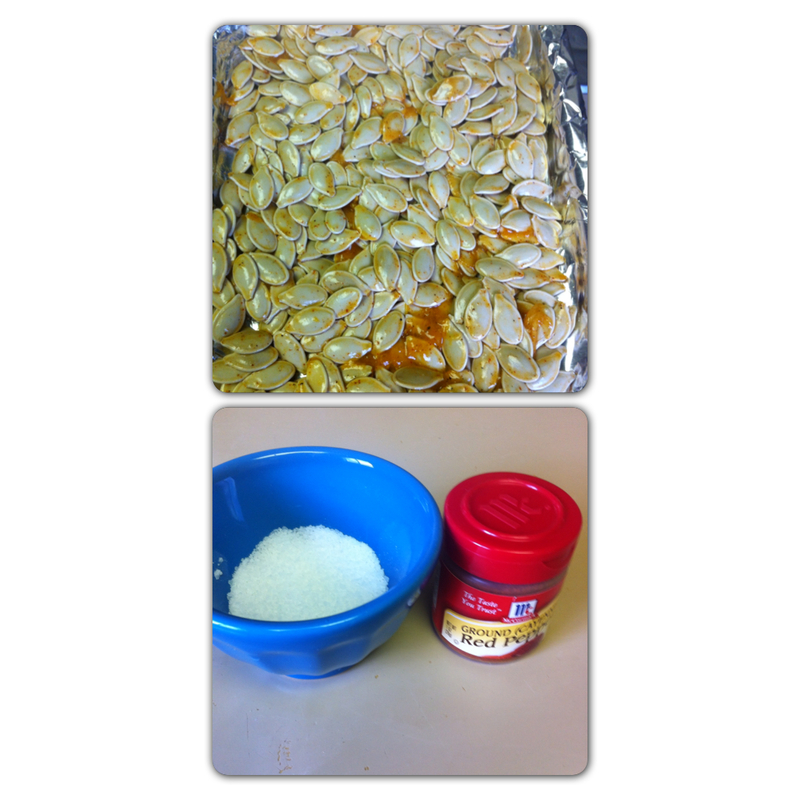 Baked pumpkin seeds are also another fall time favorite of mine. This spicy take on classic baked pumpkin seeds will have you eating the whole batch before the stew is ready (yes, I did eat them all with a little help from Jake). Although its fun to enjoy this stew out of the pumpkin- it’s not necessary to cook in the pumpkin if you want to make it once they are out of season. From my high altitude kitchen (or PomPom’s kitchen, really) to yours- Enjoy! One 8-10lb small pumpkin cut and cleaned. Rub with 1/3 cup butter, 1/3 cup brown sugar and dash of cinnamon and nutmeg and bake for 1 1/2 hours. While the pumpkin is cooking, heat vegetable oil in skillet and sear meat, browning on all sides. Remove meat and add the onion and garlic to skillet- Saute for 2 minutes just to soften. 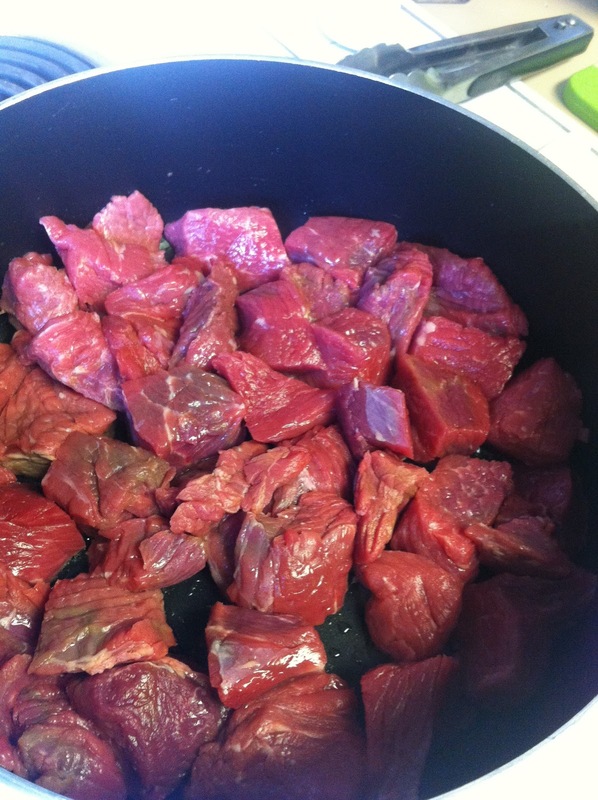 Add stock, cooked meat, tomatoes, bay leaf, salt, dried oregano, cinnamon, nutmeg and pepper to onion and garlic saute. Cover and simmer for 45 minutes. 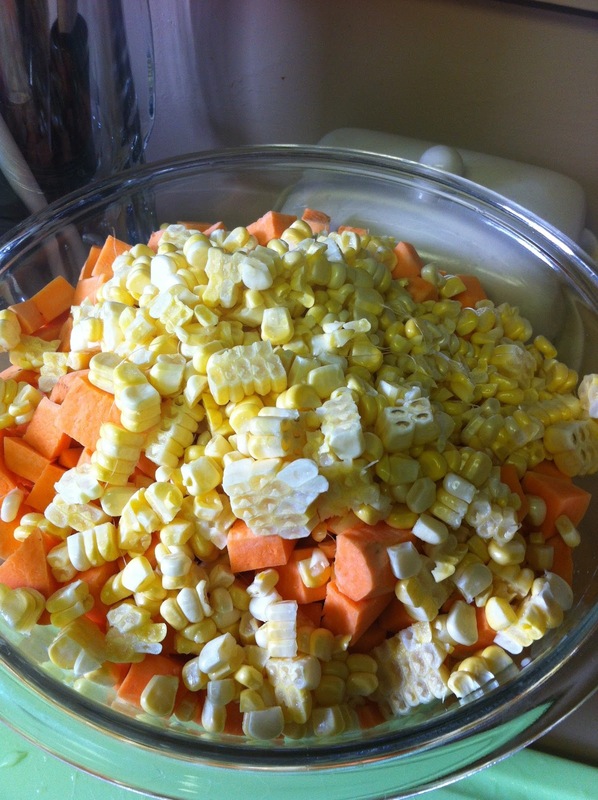 Add yams, potatoes and corn, cover and cook another 10-15 minutes. Add zucchini, apricots and peas and cook another 5 minutes. Ladle stew into the pumpkin, replace lid and bake on cookie sheet for another 30 minutes or until pumpkin flesh is soft. If all the stew does not fit in the pumpkin, leave in the pot and simmer till ready to serve! While the Stew is cooking on the stove.. 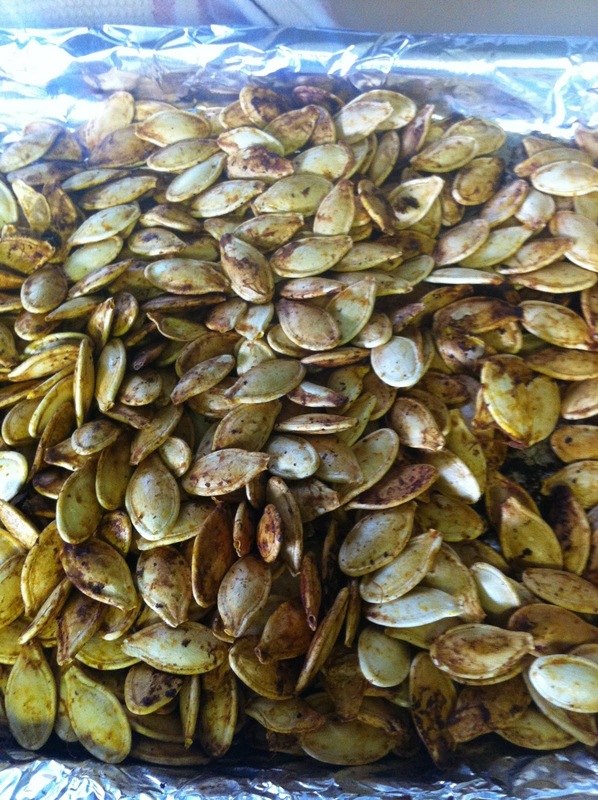 In a large bowl, toss pumpkin seeds with olive oil, salt and pepper and cayenne pepper to your taste depending on how spicy you want them (I used 2 tsp). Place on a baking sheet covered in tinfoil and bake for 25 min at 375 degrees, mixing and tossing often with a wooden spoon. This entry was posted in Entrees, Recipes and tagged Beef, Cayenne, Fall, Pumpkin, Stew by skibootsinthekitchen. Bookmark the permalink. I used to make this recipe every year when my daughter was younger. The only difference being that we used prunes instead of apricot. Unfortunately I have lost all of my recipes and had been looking for one close enough to adapt. Thank you for publishing this recipe, I’ve been searching for it for many years. I am going to share it with a friend of mine but will link to your blog page.